4 Comments Published by Cedric Benetti on Monday, November 17, 2008 at 11/17/2008 11:25:00 PM. Well maybe it's time for a new (I say new!) 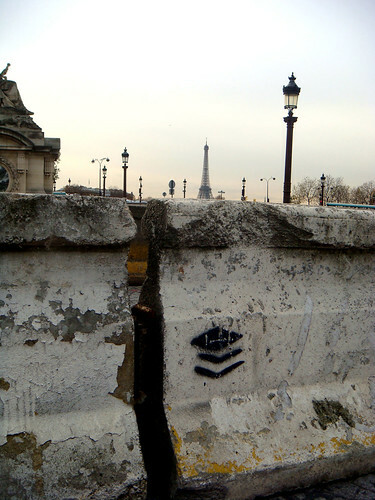 tourist attraction in Paris. The Eiffel tower is old game and tiring with the experience of playing the sardines game or sharing breakfast breath in a claustrophobic elevator going up (same experience you get in the metro every morning). 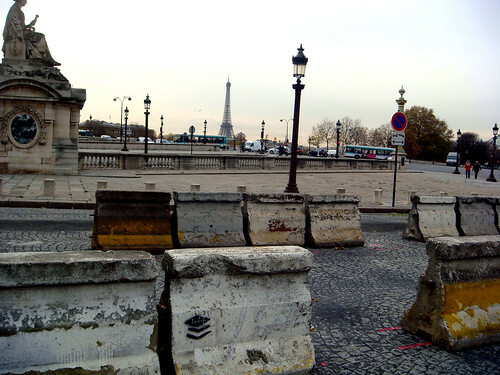 So why not come to Paris, you the Tourist (that's "you"with a capital U) and visit the Berlin Wall... in Paris... sorta downsized... jumpable some might even say. Give it some time! It will get its fame over the years. And if not, we can always sell those roadblocks to the British. The soon-to-be no-go-zone. Unless you are able to lift your legs. But it might hurt. Maybe. "Help, I can't see the Eiffel tower!" Who cares if you got this beautiful vintage wall to stare at! Raurrr! The complete building plan on the extend of the wall is not known yet, and no official statement has yet been made. On our try to get an exclusive interview with one of the roadblocks, the questioned roadblock remained silent and refused any coment whatsoever. Lol! I wish I could visit Paris some day. You can never have too many exclamation marks I say! 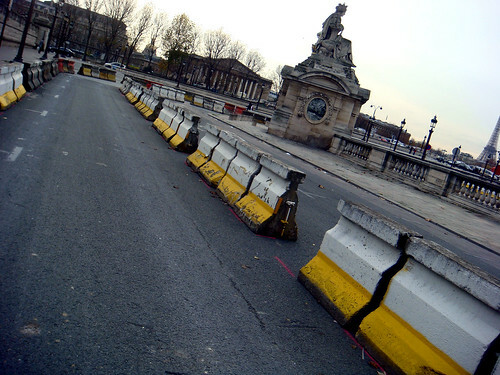 It's a wonder why those kind of barriers have been installed in Paris, France -- to tamp down and ultimately crush the underground history of the city? to slowly squash the city so that its river shorelines slowly spread out to make contact with mainland France? Here in South Florida (USA) a dead person was found beneath a tree nearby one such roadway, with mid-road barriers for miles outisde Palm Beach. Wow..Paris sounds so cool. Too bad. I live in Asia.